Buildings on the south side of Folsom, New Mexico, Kathy Weiser-Alexander, 2018. As you continue the drive on Highway 72 headed for Folsom, the descent from the Mesa is spectacular. Folsom is 19 miles past the old settlement of Bell. The coming of the Colorado and Southern Railroad in 1887 was the start of Folsom. 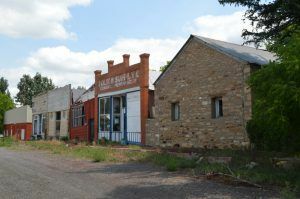 Now a semi ghost town, Folsom is a pleasant ranching community with several historic buildings. The old railroad station, moved from the right-of-way around 1970 is now a private residence; the abandoned stone two-story Folsom Hotel still stands, as well as an old gas station on the corner, several false-front stores on the south side of Main Street; and the general merchandise store, built in 1896, is now a museum. Read more about Folsom HERE. Battleship Butte. Photo by Kathy Weiser- Alexander. 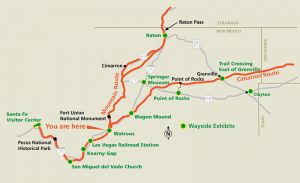 Continuing on NM 456, you will cross the Dry Cimarron River several times. At Travessier, there is a picturesque overlook, which is the entrance into the Dry Cimarron Valley, which narrows into a series of wild and wonderful sandstone formations. On the north side, you will see a particular colored sandstone formation called the “Battleship,” named in remembrance of the Maine. 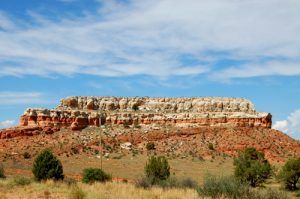 You will also see “Wedding Cake Butte,” a round mound rising about 300 feet above the valley floor, where its red, white and brown layers of sandy rock gives it an appearance of a large layered cake. In early days, many couples exchanged wedding vows atop this geographic formation. The drive along NM 456 is a refreshing change from the grasslands. Just before the Oklahoma border, turn right (south) on Hwy 406 towards McNees Crossing. A state historic sign sits in the actual “ruts” of the Santa Fe Trail. The trail crosses the North Canadian River, which is also called “Corrumpa Creek” by people who live in the area. The crossing is named for a young scout of an east-bound caravan who was killed in the autumn of 1828 by Indians. A short distance to the north is a gate (close it if you go through). To the east is a windmill; nearby is a small marker erected in 1921 on the 90th anniversary of the first celebration of July 4th, in what is now New Mexico. Continue on NM Highway 406 south towards Seneca and Clayton. You will cross traces of the Old Santa Fe Trail here and again through the Kiowa National Grassland. Many wonder why it’s possible to see so many Santa Fe Trail ruts more than 100 years after the trail closed. It’s a rule of geology that linear scars tend to perpetuate themselves – in other words, ruts are places for rainwater to run like a little stream, so they tend to keep eroding and perpetuate themselves. Clayton is approximately 23 miles from McNees Crossing. Turn right when you reach US 56 to Clayton. North of Clayton on Highway 370, visit The Clayton Lake State Park to see the tracks left by at least eight different kinds of dinosaurs. Some 100 million years ago this site was actually the shoreline of the Gulf of Mexico. The site is well interpreted and accessible by stairs and a boardwalk. Several of the tracks are unique or reported at only one other site in the world. 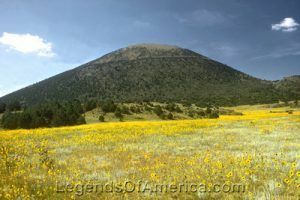 Capulin was a distinct landmark for those pioneers who traveled the Santa F Trail. Photo by the National Park Service. Continue north on Highway 370, turn left on NM Highway 456 back to Folsom. From Folsom, Capulin Mountain is nine miles southwest on NM Highway 325, where you’ll pass Twin Mountain red cinder rock quarry where Black Jack Ketchum was caught. Learning that train robbery was not a viable career option, he was hanged in Clayton, where his body still rests in the cemetery. The Capulin Volcano National Monument is the only volcano in the world where you can drive to the top and then walk down into the crater or hike the one-mile rim trail for a stunning panorama of the Raton-Clayton Volcanic Field. The volcano was withdrawn from public entry in 1891, but was proclaimed a National Monument by President Wilson on August 9, 1916. It now has a visitor center, a bookstore and exhibits. 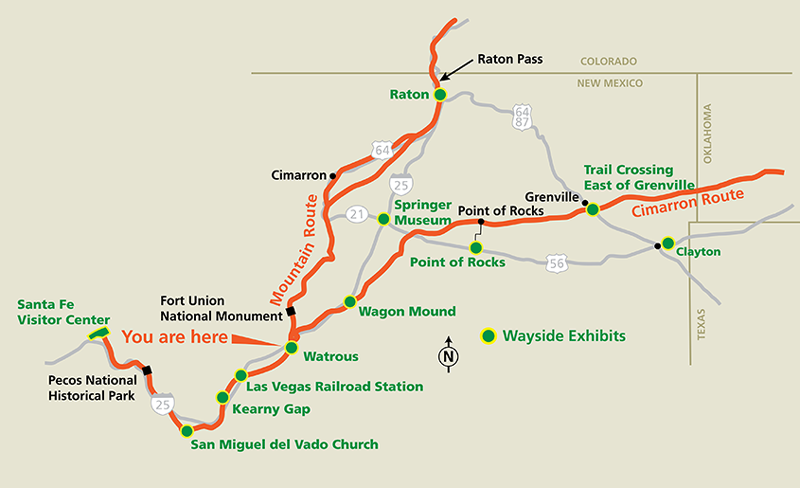 To the southeast of Capulin is Sierra Grande, the largest single mountain in the United States — 40 miles around the base and covering 50 square miles. Capulin Volcano National Park closes its doors at 4:30 p.m. — so try to get there by mid-afternoon at the latest. It’s just a short trip to Capulin where one may find food and fuel and an RV camp, or from Folsom, it is eight miles to Des Moines for food, fuel and lodging. Kenton, Oklahoma Mercantile. Click for prints & products. 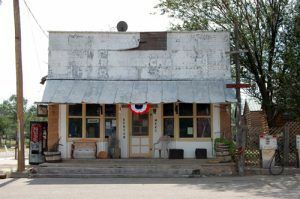 Up until 1890, there were no schools in what would become Cimarron County, in the Oklahoma Panhandle and only two communities and post offices — in Mineral City, which claimed 98 inhabitants, and the other in Carrizo, which boasted some 83 people. Carrizo was established about a mile west of where Kenton would later be established. Today, Kenton is mostly quiet, supporting about 17 residents, including just three children. Two of the children go to school in Clayton, New Mexico, the other to Boise City. Both places are about a 100-mile round trip to school and back every day. Read more about Kenton HERE. © Kathy Weiser/Legends of America, updated August 2018.